The parents of Soren were shuttlecraft pilots. Soren was flying on shuttles with them since before learning to walk. When old enough, Soren joined formal flight school, where Krite was the instructor. In 2368, Soren and USS Enterprise-D first officer William T. Riker worked together on a mission to rescue a lost J'naii shuttle, the Taris Murn, from a pocket of null space located in their star system. During this time, Soren revealed to Riker of having a female identity, despite a powerful social taboo against considering oneself to have a gender. They began to fall in love, and although attempting to keep their relationship secret, Krite reported the affair to the J'naii authorities. 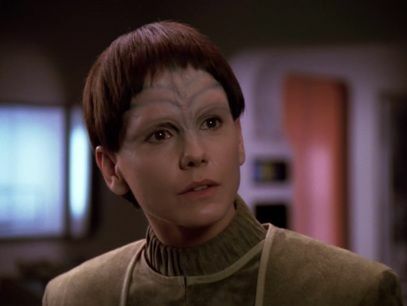 Soren requested and was granted asylum before she could be arrested and she left with the Enterprise-D. She decided not to pursue the relationship with Riker but he did support her application to the Academy and she was admitted as a Freshman in 2369. She struggled at the Academy especially her first year but her grades were just good enough to not flunk out. It got easier during the four years and she graduated on time and was posted to the Sovereign class USS Enterprise-E reuniting her with the Enterprise crew at the request of Riker and Picard. When Riker was given his own command he took Soren with him to the Titan.